Copper, Stainless Steel, Quartz, Fireclay... so many choices. We're here to help you select the perfect sink for your kitchen. Learn more below or call us today. Stainless Steel is the most popular material choice today. It compliments stainless steel appliances and a variety of lighting and faucet finishes. The most important thing to look for is the gauge if sink which tells you how thick the steel is. The lower the number, the thicker the sheet of steel used to make it. But... not every 18 gauge sink is equal! 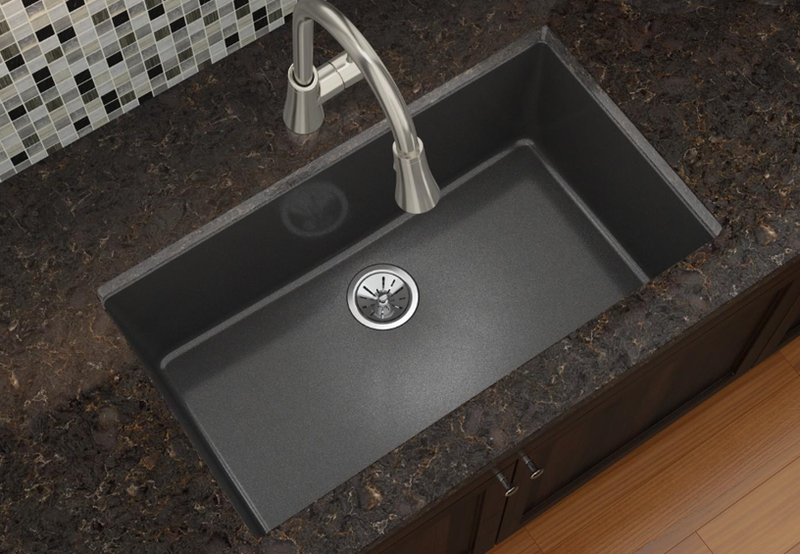 Manufacturers like Elkay for example, ensure that their sinks made in the USA are 18 gauge after production, while most other companies start with 18 gauge but the stretching during production thins it out. Referred to as Quartz or Granite Sinks, these are both actually composite sinks made of Quartz AND Granite. Due to the natural strength of these stones, these are very durable sinks that are very easy to care for. Super resistant to stains, chips and cracks, these types of sinks are made to last a lifetime with practically no maintenance. They are offered in a variety of colors so you can choose one to compliment your décor, or make a statement with a pop of color. Fireclay is a material that is similar to vitreous china but is fired at a much higher temperature to produce a very dense finished product. While they may look like cast iron, they are much more durable, and unlike the porcelain enamel that overlays cast iron, this shiny finish is actually a result of the firing process and will not chip. Fireclay is resistant to acid, alkali, scratches and impacts. If you're looking for something more unique there are a few materials that will certainly give your kitchen some extra character! These are examples of some of the other sink materials available. Some require a little more careful maintenance but as long as you follow the manufacturer's care instructions, they will provide you with years of beauty.